Hall Printing, operating in Trail and Nelson and everywhere in between, are proud of their continuing ability to provide their award-winning professional printing services for West Kootenay businesses and residents. From beautifully designed books to single page documents, Hall Printing continues to be a leader in their field. 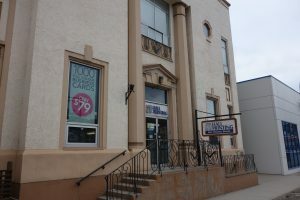 Owner Ingrid Hope has been steering this valued community-minded business for 14 years and has worked for Hall Printing for a total of 28 years. Throughout this time, she has been dedicated to fulfilling the needs of her clients. “We are proud to offer the services we provide for the West Kootenays,” Ingrid stated during my visit and tour of their Trail facilities, “and although we are very proud to have served the region for 99 years, I like to point out that I haven’t worked here for that whole time”. All kidding aside, I was amazed by the diversity of Hall’s printing capability and the high level of professional results that they achieve with everything they do. Printing is a complicated and diverse profession, with all kinds of complex equipment and creative thinking being required. 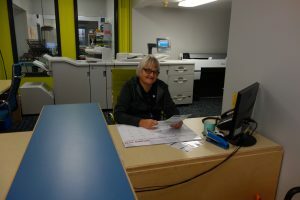 Hall Printing, under the leadership of Ingrid and with the assistance of the 14 employees who work at their facilities, continues to be a valuable business asset to our region. The overall impression I received from my visit was that if you have printing needs – you have only to contact Hall Printing to have them satisfied to the highest possible degree. Great work Ingrid, and thanks for your time and the tour! We all look forward to having Hall continue to be the stalwart business leader they are within our business communities, and our communities in general, for at least another 99 years. This entry was posted in 2019 Feature Business. Bookmark the permalink.